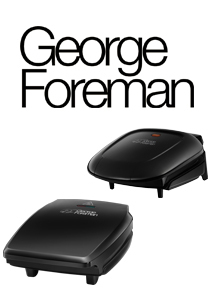 The compact range from George Foreman provides the same great quality as the larger models. The 18840 2-portion compact grill features thicker grill plates for more efficient heat up, Non-stick coating and floating hinge. Designed to be stored up right to free up counter space and with a perfect fit drip tray to reduce mess. Following Suite with a compact design is the 23410 3-portion compact grills, featuring the same key points as the 18840. These compact grills are perfect for young professionals and students alike.